ZWEIBRÜCKEN,July 12 2018 – This job had its challenges. On behalf of UK Generator Manufacturer, crane service provider McGovern Crane Hire from Derbyshire in central England was to lift a 21-tonne generator on the grounds of the Birmingham Children’s Hospital. Usually a simple task. If not for the extremely tight space conditions that made it impossible to use a sufficiently large and strong crane in the hospital driveway. The solution was using a Demag® AC 220-5 all-terrain crane that was compact enough to fit in the driveway, yet with the innovative IC-1 Plus control system, it offered sufficient lifting power with asymmetrically configured outriggers. Two ways of lifting were considered. The team could have used a large crane with a minimum lifting capacity of 350 to 500 tonnes. However, it would not have been able to fit in the narrow driveway because of its dimensions, so it would have to be set up on the opposite side of the road. From there the crane would have to lift the generator at a boom radius of about 50 meters. “We decided not to use this lifting scenario, as the site had concerns regarding the larger cranes due to ground capacity and having to lift the loads over the hospitals Nitrogen tanks so we opted for the second version with a smaller crane and decided to use our new AC 220-5 for this operation,” explains Kieran McGovern. However, this only worked because this crane features the IC-1 Plus control system, which is predestined for such applications. In order to be able to lift the load with its gross weight of 22 tonnes, including hook block and lifting tackle, the AC 220-5 was equipped with a counterweight of 51 tonnes. The outriggers were set as required to meet the needs of the job site. Thus, it was possible to lift the generator at a boom length of 33.3 meters and a radius of 15.0 meters off the lowbed trailer in the driveway to a height of 10.0 meters. It was then lifted over adjacent buildings by slewing the crane directly over the front right rigger which was completley retracted, the crane continued slewing right until over the back right rigger which was extended to three quarters and easily lowered down at the desired location with a final radius of 19.7 meters. The conclusion of Kieran McGovern is correspondingly positive. “We know that we can perform very complex tasks safely and economically with the AC 220-5 equipped with the IC-1 Plus. Thanks to theIC-1 Plus control system, we can use a smaller crane that is more cost-effective for our customers in many jobs, and we also need less counterweight for the crane.” Of course this also translates into lower costs. 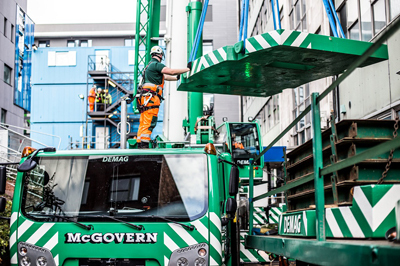 Founded in 1995, McGovern Crane Hire, located in Derbyshire in the English Midlands, offers its services nationwide. The range of services includes lifting work of all kinds, including the execution of large and complex projects. In addition to modern high-performance cranes, McGovern also provides its customers with all the necessary lifting equipment. Computer-aided lift plans including 2D and 3D simulations complete the range of services.